We are challenging ourselves to develop for our customers some of the best engineering solutions available today. Every new project brings with it new requirements regarding building technologies, given us the opportunity to offer our clients new breakthroughs and stay current on the latest advances. The project is monitored and controlled by our IoT Platform CAVI Smart Monitoring, ensuring a bird’s-eye view over the entire infrastructure-related processes. The urban-architectural concept design of the shopping mall was selected through an international competition organized by CRE International. Global Technical Group was appointed entrepreneur in Promenada Novi Sad together with Philips, offering unique solutions in terms of architectural lighting. This facility, whose total area amounts to 150,000 m2 is an investment by NEPI Rockcastle, one of the leading companies in commercial real estate in the CEE region, worth EUR 128 million. In addition to various features it offers, Promenada has provided employment for over 1,500 people. 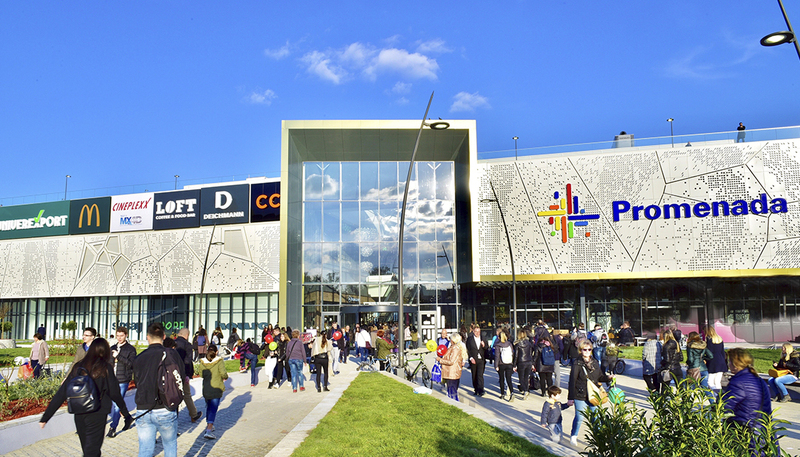 “Promenada is one of the most important additions to the rich portfolio of NEPI Rockcastle, which includes not just the Kragujevac Plaza shopping center, our first shopping center in Serbia, but also the leading centers in Romania, Poland, Slovakia, Croatia, Bulgaria, Hungary, the Czech Republic and Lithuania”, said the manager of Promenada, Boris Stevovic.